Want to learn how to turn ordinary dish into extraordinary?This social masterclass will be presented by head chef and owner of Ma Pasion, Eddie Huynh. Eddie Huynh has worked in various fine dining restaurants such as Taxing Dining Room and Bistro Gulliaume and has gained experiences from world renowned chefs such as Gordon Ramsay and the Iron Chefs from Japan.His experiences and knowledge in fine food allows him to turn something ordinary to extraordinary.With a few simple techniques, Eddie can show you how to cook like a professional in your very own home. He will show you how to plate up two course meal of a main and dessert into fine dining dishes. You’ll get the chance to channel your creativity and create your own wining dishes in small groups. The best thing of all, you can relax and enjoy your own creations with a glass of wine in great company of other food lovers! This is no ordinary masterclass.Our classes are relaxed and intimate with small guests of 12. Not only you’ll get to learn but also socialise with like minded people!. You’ll be greeted with a glass of sparkling as you mingle and meet other guests when you arrive. 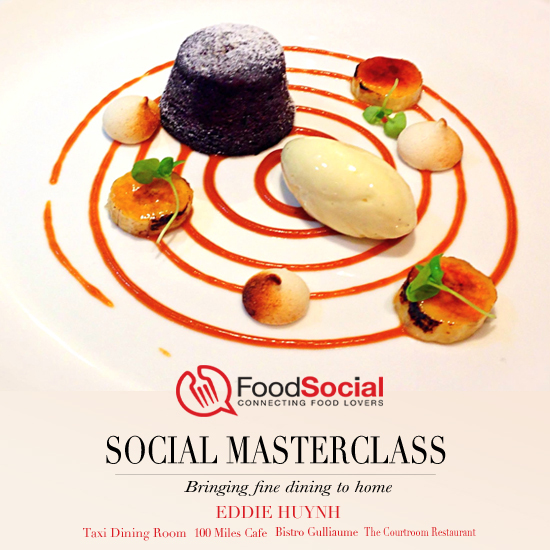 Come along and join us at this social and interactive social masterclass! At the tender age of 25, Eddie achieved head chef status at 100 Mile Cafe. He has worked at renowned restaurants such as Taxi Dining Room, Bistro Guilliaume, The Courthouse Restaurant & Boynton’s Feathertop Winery. Now, he wants to bring his passion, talent and skills to your kitchen in his own private chef company, Ma Pasion. Connecting Food Lovers. Join today!